Home / Crafty Chatter / Mollie Makes Out Soon! 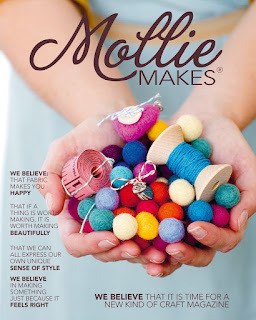 The new contemporary craft magazine MOLLIE MAKES is out this week – and you can still get the first 3 issues on subscription for ONLY £5, which is the normal price for 1!… So of course I have signed up as in these thrifty times we think it is a bargain piece of style! Cant wait to see what the team have in store… but a little bird tells me that they have a free ipod case as the gift and Apple Cosies as the cover project… will check back later when it hits my mat!